Saving/restoring registers to/from the stack. Saving function local variables, arguments, and return address on the stack. Usage and manipulation of stack specific registers — Stack pointer and Frame pointer. The code examples presented are written and compiled on Linux systems running on 64bit x86 platform. But, the discussion will still give a generic understanding of the stack. On x86 platforms, stack space allocated to the process grows downwards — higher to lower memory addresses. If we take the following code example, the diagram below it shows how stack frames are created and removed from the stack during a typical call sequence. The above diagram shows how the stack memory gets allocated and de-allocated as the execution of the above program proceeds and functions call each other. But, what is this stack frame ? What information does it contain ? How does it get created and manipulated ? Why is it even used ? The next section of the post will answer such questions. Arguments passed by the caller. Return address to the caller. Frame pointer for the previous frame (stack frame for the caller at a memory address higher than the current frame). Exception handling information (if any). Saved value of the CPU registers that the callee (called function) can’t modify freely, and thus they first need to be preserved on the stack. 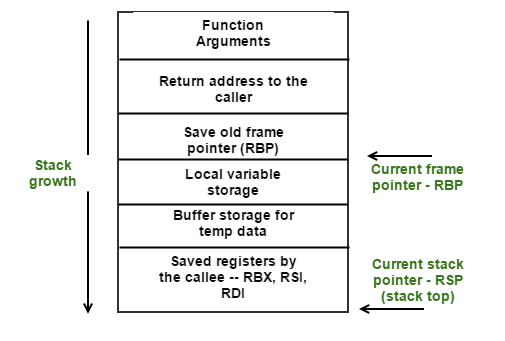 A stack pointer is one of the general purpose registers (RSP) provided by x86. It contains a reference to the top of the stack. Please don’t forget that stack grows downwards, so top of the stack is at numerically lower address than other elements in the stack. A frame pointer is also one of the general purpose registers (RBP) provided by x86. The value (address) stored in the frame pointer is used as an offset to access the local variables, arguments, return address stored in the stack frame of the function under execution. PUSH source – decrements the value of stack pointer and stores the “source” information at the top of stack. POP dest – pops the value from the top of stack or loads the destination “dest” with the value from the top of stack and increments the stack pointer. How a stack-frame is setup ? Let’s say function foo() calls function bar(). Push the arguments of bar() on stack. Note that arguments are pushed in reverse order — right to left. Push the return address (the current value in instruction-pointer (RIP) register) on stack. Push the RBP register value on stack. This value is the frame pointer for bar()’s caller which is foo() and is commonly referred to as “old RBP”. Move the current value of RSP register to RBP register. This new value of RBP is the frame pointer for callee or bar()’s stack frame. Decrement RSP to create storage space for local variables and buffers. Preserve registers on the stack. After the function arguments and return address have been saved onto the stack, return address is at the top of the stack. Hence. at this moment, RSP points to this memory location. We further decrement the RSP by pushing the RBP register value (previous frame pointer) onto the stack. RBP register value is at the top of stack implying RSP points to this location. We now move the RSP value to RBP making both RSP and RBP point to the same location on stack. The RBP becomes the frame pointer for the current frame under concern. RSP get further decremented as space for local variables, temporary buffers is allocated. Finally, the callee may preserve some registers on stack which results in further growth of stack. Following are at the positive offsets from the frame pointer. Assembly level instructions performed to set-up the stack. Restoring of frame pointer and base pointer along with other registers.